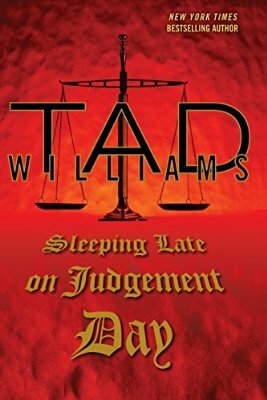 Cover of Sleeping Late on Judgement Day, third volume in Tad Williams’ “Bobby Dollar” books. Speculative fiction author Tad Williams will be in London at the Forbidden Planet London Megastore (179 Shaftesbury Avenue, WC2H 8JR) on Tuesday, July 21st, from 6-7 PM. He will be signing Sleeping Late on Judgement Day, his third Bobby Dollar novel. Further details are here. Williams will also appear at Kepler’s Bookstore in Menlo Park, California, (1010 El Camino Real) on Monday, August 24th at 7:30 PM. The event is called “John Scalzi in conversation with Tad Williams”, and Williams will be chatting with Hugo-award winning author John Scalzi. This is a ticketed event. More information is available here. More tour dates will be posted here as we hear of them.